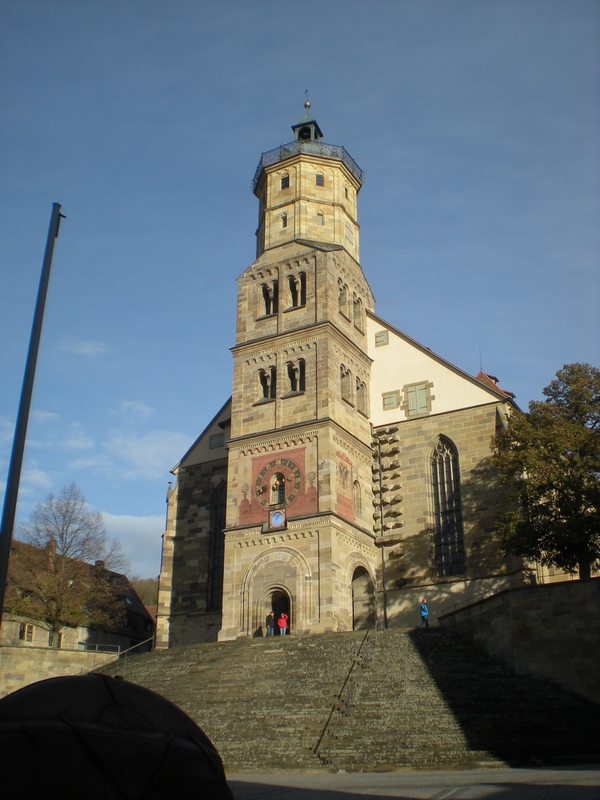 So, I promised you a post about my trip to Schwäbisch Hall, and you would have got it sooner if I hadn’t gone down with the cold from hell and ended up spending most of the weekend in bed (I kind of got up on Sunday… I moved as far as the sofa, where I wrapped myself in a blanket and watched Newcastle play football against Liverpool. We drew. *Sigh*). 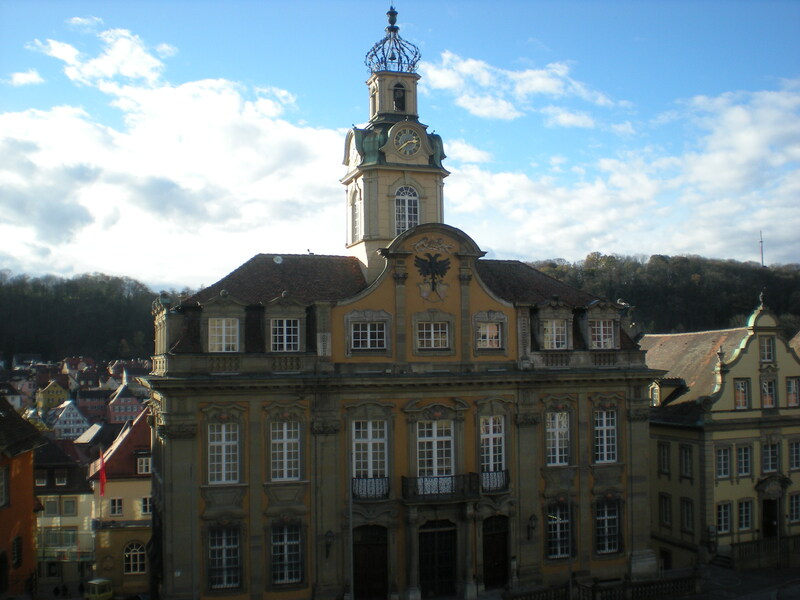 Anway… Schwäbisch Hall. It doesn’t quite have the fairytale beauty of Tübingen, but it’s old and has lots of pretty half-timbered houses, which is good enough for me. Well, it made me smile anyway 🙂 Add to that the fact that the food was, in fact, delicious and you’re on to a winner! Entebäck definitely gets my recommendation. Also, the people on the table next to us had a million special wishes (one of them seemed to be on a very restricted diet), all of which were complied with without complaint, which doesn’t always happen (as I know from experience after many meals out with a family friend who has coeliac’s disease, i.e. can’t eat gluten. You’d be amazed how many restauarants have trouble with the question “what do you thicken your sauces with?”). And opposite it the Rathaus (Town Hall) – slightly nicer than Karlsruhe’s effort! (One day I’ll post a photo for you and you’ll see what I mean. Or you can Google it. I’m sure there are images somewhere on the web). 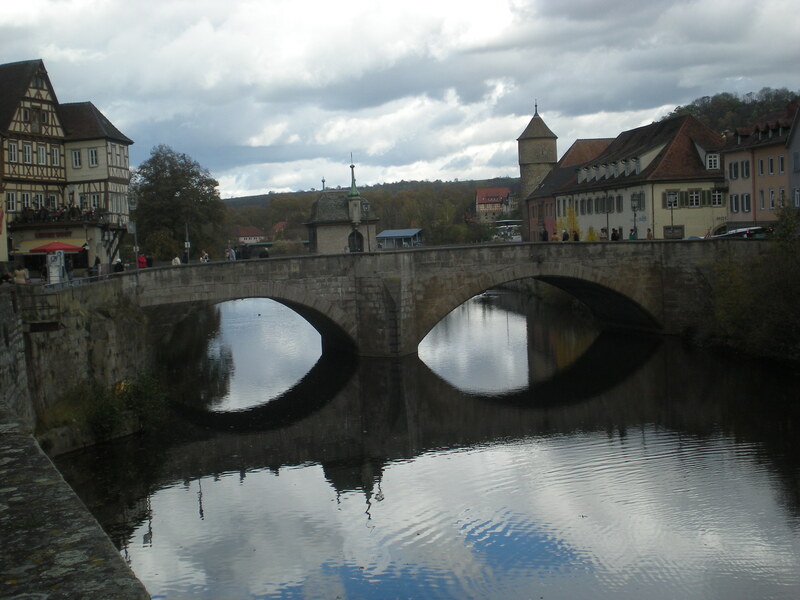 The river that runs through Schwäbisch Hall is called the Kocher. I love that the town is built up around the river – Karlsruhe is technically in the Rhine valley but the River Rhine is nowhere near the town centre. I miss living near water! We were lucky with the weather for most of the day (just look at the blue sky behind the Rathaus1), but by 6:30 p.m. it had started to rain quite heavily. Since it was also dark by that time and my throat was already beginning to hurt (the start of the evil cold from hell! ), we decided to head for home. And that was Schwäbisch Hall, number seven on my list of 30 towns to visit before 30… I wonder where my travels will take me next? Update from August 2014: I’ve added this post to the Travel edition of the Expat Bloggers Bloghop over at Young Germany, check out the other entries here. I’ve managed to get quite a lot done today, most of it at the same time. Write some notes for my dissertation, wash the dishes, a few more notes for my dissertation, spray cleaning stuff on the shower, sweep the bedroom floor, back to the shower to rinse. Who knew I could be so productive? Last night Jan and I went to see out with some friends to see a… well, not really a band. A choir really, I suppose. An A Capella choir. But instead of choir music they sing pop songs. Covers of pop songs, songs using the tunes of pop songs but with the lyrics changed. They were very good and very, very funny. Unfortunately, most of their stuff is in German, but there were a few English bits too. Anyway, they’re called Füenf and you can find their website here in case you feel like checking them out. I made cupcakes today as well. 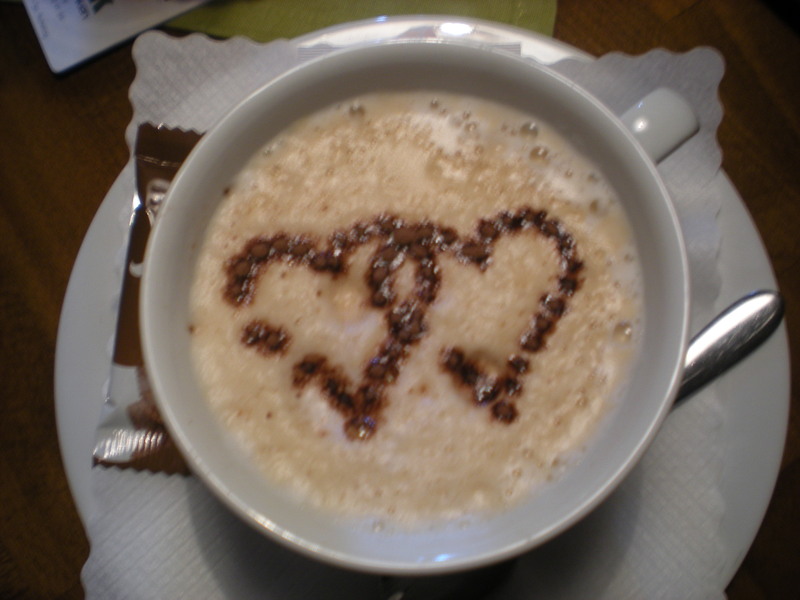 I even put little hearts on the top, in honour of Valentine’s Day. Jan and I don’t really do Valentine’s Day. It falls right after our “anniversary” (it still seems weird saying that when we’re not married), which is obviously way more important. And everyone knows Valentine’s Day is just a card manufaturers’ scam anyway. So we didn’t exchange any cards or gifts today. 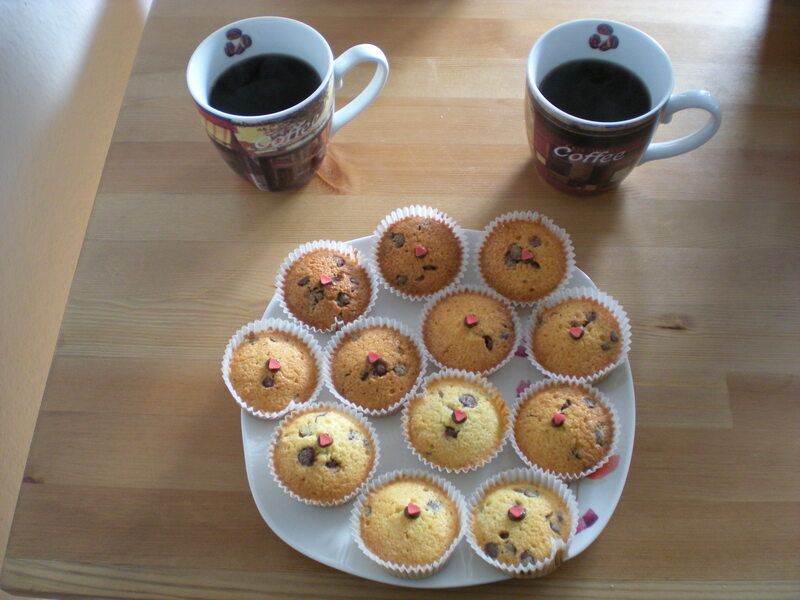 Instead, we took a break from our respective dissertations to eat cupcakes and drink coffee together. It’s always nice to spend time just being together, no matter what the occasion. But coffee and cake… I’m turning into a German! Oh well, happy Valentine’s Day anyway. Cupcake anyone? This morning I overheard a phone conversation in which someone was apparantly explaining the concept of changing trains. “I’ll be travelling for a while yet, I have to change trains now” *Pause while, presumably, the other person spoke”. “We’re just pulling into Mannheim now then I have to get out of the train, go to another platform then get on a different train”. He wasn’t even speaking to a child either (unless I missed the point where it became normal to address children as Mr. so-and-so). The mind really does boggle. Or at least mine does. Having spent the last two evenings searching every clothes shop in Karlsruhe for something to wear over a dress at a wedding I’m invited to next month. I’ve come to the conclusion that the colour white is an endangered species this season. I even resorted to looking in United Colours of Benetton today – the first time I’ve been in there since I was about 12. Unsurprisingly I found nothing I liked. Despite not finding the top I wanted, I have spent a small fortune over the last few days. A serious dent has been made in my wages already and November isn’t even here yet. Not good people! Snippets is a fabulous word. I feel like I should use it more often. What have I done this weekend? So that’s me. Did you all have good weekends? I’m going to do some uni work now. But not until after I’ve written a letter to a friend. I wouldn’t be me if I didn’t find some way to procrastinate. Actually Saturday is pretty much over at this point but the title was too good not to use. (OK, it wasn’t actually that good but I couldn’t think of a better one). A friend of mine who used to be a language assistant with me has come back to Germany to do a second assistantship. This time she’s living in another town roughly 45 minutes away from Karlsruhe, but today she came into town so Jan and I went to see her. We went to Cafe Emaille for lunch then to Gelbe Seiten Cafe so that we could have coffee and I could pick up some books. I needed new ones to read on my daily journey to work and they have a bookcrossing zone there. Hooray for free books! After coffee we headed to C&A so that Jan could buy me some clothes. (And before you start thinking I’m one of those girlfriends I should point out that normally I buy my own clothes, but this particular shopping trip was part of my birthday present. He doesn’t like to surprise me with clothes in case a) I don’t like them or b) they don’t fit, so instead I got a birthday card promising me a shopping trip at a later date). Currently Jan is at his flat where he has to pick up a few things. But soon he’ll be coming over again so we can have dinner. Then we plan to spend the rest of the evening eating Ben & Jerry’s icecream and watching films. Not a bad Saturday I’m sure you’ll agree. Is it just me or has this been a looong day? I actually had a cup of coffee at work this morning. This is a rare occurence… I’m too lazy to put the coffee maker on. But there was a language lesson going on (we do language courses as well as translation) and someone had made coffee for the teacher, so I got a cup. Hurrah! It didn’t wake me up any though. I’m still incredibly tired. I would say an early night is in order, but the boyfriend said he would call tonight and he never calls before 10pm, ever. After work I went shopping. I had to buy stuff for the meal I’m cooking for my floor tomorrow. Yesterday I went shopping for myself. I spent 9 euros and 90 cents. For my whole weeks shopping. Today I spent 13 euros, on shopping for one meal for my floor. And I didn’t even buy everything! I left the most expensive bits to Jan, not because I’m tight but because it’s much easier for him to get hold of fresh parsley and 1,000g of mince. Aldi don’t do fresh herbs. They barely even do dried herbs! Jan has access to shops where they do sell such things, and also has the added advantage of being able to ask for stuff in German (ok, I can ask for stuff in German too… I just don’t want to). I decided on strawberries and cream for the dessert. It’s kind of typically English… at least I’ve never met any German who would think of putting cream on their strawberries (it’s all about yoghurt or icecream here) and it takes much less work than trifle or even the incredibly simple apple crumble. A winner all round I’d say. It took me an hour and a half to do my hair last night. I just don’t have the kind of hair that you can do things with. It’s incredibly thick, which hairdressers will tell you is a good thing, but it’s not. Next time you’re in a place that sells hair accessories take a look and see how many of them have a little sticker saying “for thick hair”. If you manage to find more than 3 it will be a miracle. If more than 1 of those is not ugly please tell me where that shop is, I need to go there right now! Anyway, last night. I knew I couldn’t leave it down, not for a posh restaurant, so it had to go up. My first attempt took 10 minutes and a dozen hair clips. From the front it looked ok, but then I saw the back. It was a mess. So down it came. I then tried putting part of it up and leaving a bit down at the back. It didn’t work. At all. Six tries later I was sweating, exhausted and frustrated, but at least I’d managed to get my hair up. By the time I’d managed to get my make up done we were running late and had to rush into town. Rushing in sandals with heels isn’t good. I now have blisters on the balls of my feet, which hurts a lot and makes it difficult to walk, I won’t be wearing those shoes again for a while! It was worth it though, the rest of the night was amazing! When we arrived at the hotel we were first shown to our room. Yes, we had a whole room all to ourselves! The nice waiter man took our jackets then suggested that we head over the the bar for some aperitifs. They called it a bar, and there was indeed a bar at one end, but the room itself looked like something in a stately home. It was amazing! Portraits on the wall, nice carpets and posh armchairs everywhere. Wow! We ordered our drinks, which were incredible. I had a cocktail of champagne with strawberry liquer and strawberry juice. To go with our drinks we were rought some hors d’ouvres. Little pieces of bread cut into circles and squares with tiny but perfectly arranged toppings. Fabulous. After the appertisers we headed back to our room. We were served our starters and the wine expert came by to advise us on what to drink. We started with a sweet white wine that tasted almost like lemonade. Later we switched to a dryer white wine, which I then stuck to for the rest of the night. There was also a red wine to go with the later courses. I tried the red wine but didn’t like it. The starters (can’t remember what they were) were followed by foamed goose liver pate with goose mince arranged on top of it. It tasted a lot nicer than it sounds! Next came the fish course. We had kingfish fillet, which I really enjoyed. Then came something that was called “Flusskrebs” in German. I’ve just looked it up and found out that means crayfish, so there you go. It was quite nice anyway, but I couldn’t have eaten too much of it. Good job posh portions are only little! After the crayfish came the part I had been waiting for all night. Meat! It was ram I believe (trying to translate from the German here). I usually prefer my meat well done, and this was only medium, but it actually tasted incredible. All of these courses were served by 3 or 4 waiters at a time, who then placed the plates in front of us all at once. Before each course our waiter came in and explained what we were about to eat.